Although touchscreens are not brand new inventions, their accuracy, speed and size has dramatically increased lately. Combining it with latest 3D or other technologies can lead to very impressive outcome. 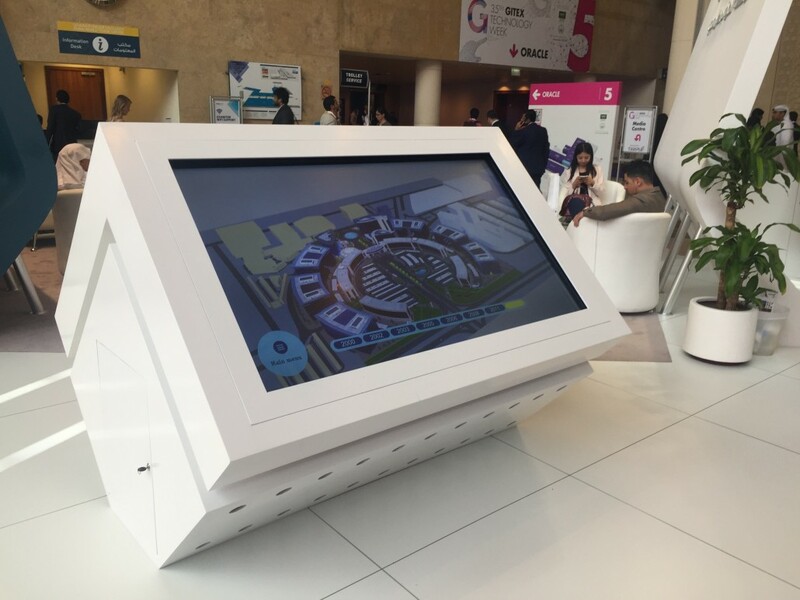 It is a great tool for exhibitions, company presentations, interactive experience or sales tool. Users mainly encounter touchscreens at point of sales locations, like shopping malls and at exhibitions. It is used to extend the first impression of a brand or companies and it can deliver multiple layers of information. Touchscreens are in one way an extensions of tablets, and although they are fixed in position their size and easy handling deliver the wow factor. Combine it with ‘free walk’ in rendered 3D environment, and users are deeply involved touching, swiping and flying on your screens. Use it with panoramic pictures or videos, and users feel that they are really in the middle of the experience –although that they cannot turn the device, they see everything in a huge size – an in this case size does matter. Even company videos or rendered animations deliver greater experience on large touchscreens. State of the art multi touch controls enable that more people can use it simultaneously, so imagine that in competition games or shared experience situations – that can only delivered by touchscreens. It can be used in education (schools, museums) as a great learning supplement. Last but not least, it is a great tool for sales purposes, where easy navigation and well-built user journey can lead to users who are willing to play with or get information from your touchscreen hence with your content. More to that touchscreens can run automatically, and deliver the message without supervision. Information panels, presentation tools, demonstrational aid, gaming, learning – you name it, we deliver it.